On Tuesday, April 18, representatives of the Organic Consumers Association and our Regeneration International project gathered in The Hague, Netherlands, along with members of other civil society groups, scientists and journalists. We assembled to hear the opinions of the five judges who presided over the International Monsanto Tribunal. After taking six months to review the testimony of 28 witnesses who testified during the two-day citizens’ tribunal held in The Hague last October, the judges were ready to report on their 53-page Advisory Opinion. The upshot of the judges’ opinion? Monsanto has engaged in practices that have violated the basic human right to a healthy environment, the right to food, the right to health, and the right of scientists to freely conduct indispensable research. The completion of the Tribunal judges’ work coincides with heightened scrutiny of Monsanto, during a period when the company seeks to complete a merger with Germany-based Bayer. In addition to our organization’s recently filed lawsuit against Monsanto, the St. Louis-based chemical maker is facing more than 800 lawsuits by people who developed non-Hodgkin lymphoma after being exposed to Monsanto’s Roundup herbicide. As a result of recently-made-public court documents related to those lawsuits, pressure is mounting for Congress to investigate alleged collusion between former EPA officials and Monsanto to bury the truth about the health risks of Roundup. The timing couldn’t have been better for the Monsanto Tribunal to announce its opinions. But is time running out for us to hold Monsanto accountable — and replace its failed, degenerative model with a food and farming system that regenerates soil, health and local economies? In fact, organizers of the Tribunal had no say in the judges’ final opinion. And the judges themselves are all independent, highly qualified lawyers and legal experts, recognized by the international legal community for their accomplishments and credentials. Their objective is twofold: alerting public opinion, stakeholders and policy-makers to acts considered as unacceptable and unjustifiable under legal standards; contributing to the advancement of national and international law. The work and conclusions of opinion tribunals are shared with all relevant actors and widely disseminated in the national and international community. Most opinion tribunals have had a considerable impact, and it is now accepted that they contribute to the progressive development of international law. As we wrote last year, the Monsanto Tribunal judges were asked to consider six questions, referred to as the “Terms of Reference.” During two days of testimony, the judges heard from 28 witnesses (representing about 15 countries) on matters relating to the six questions. Because of the current state of international law and the absence of specific evidence, the Tribunal cannot give any definitive answer to the question it was asked. Nevertheless, it seems that Monsanto knew how its products would be used and had information on the consequences for human health and the environment. The Tribunal is of the view that, would the crime of Ecocide be added in International law, the reported facts could fall within the jurisdiction of the International Criminal Court (ICC). And that brings us to question six: Could the activities of Monsanto constitute a crime of ecocide, understood as causing serious damage or destroying the environment, so as to significantly and durably alter the global commons or ecosystem services upon which certain human groups rely? Possibly — if ecocide were recognized as an international crime, under the Rome Statute. Because it isn’t, at least not yet, the judges could only add to existing calls for the International Law Commission to amend the Rome Statute to include ecocide on its list of international crimes. The Tribunal assesses that international law should now precisely and clearly assert the protection of the environment and the crime of ecocide. The Tribunal concludes that if such a crime of ecocide were recognized in international criminal law, the activities of Monsanto could possibly constitute a crime of ecocide. Several of the company’s activities may fall within this infraction, such as the manufacture and supply of glyphosate-based herbicides to Colombia in the context of its plan for aerial application on coca crops, which negatively impacted the environment and the health of local populations; the large-scale use of dangerous agrochemicals in industrial agriculture; and the engineering, production, introduction and release of genetically engineered crops. Severe contamination of plant diversity, soils and waters would also fall within the qualification of ecocide. Finally, the introduction of persistent organic pollutants such as PCB into the environment causing widespread, long-lasting and severe environmental harm and affecting the right of the future generations could fall within the qualification of ecocide as well. We can’t do justice here to the Tribunal judges’ 53-page Advisory Opinion. 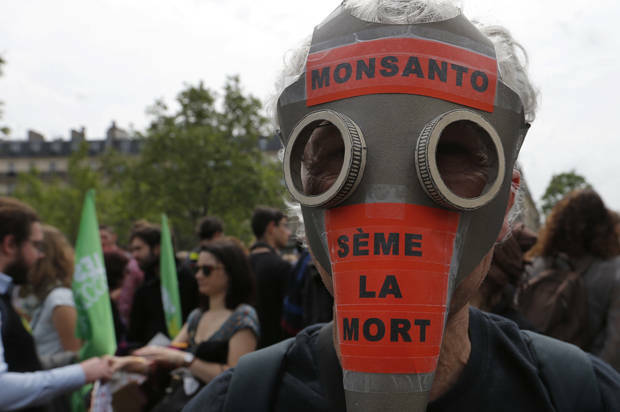 The Opinion, which include 120 citations, paints a detailed picture of how Monsanto violates human rights and ravages the environment, on a global scale. In their published Opinion, the judges call for changes in international law in order to give priority to human rights, over the rights of corporations, and to hold corporations accountable for violating human and environmental rights. While according companies like Monsanto unprecedented rights and entitlements, international law has failed woefully to impose any corresponding obligation to protect human rights and the environment. However, it is beyond the scope of this advisory opinion to consider the breadth of reforms required to re-align the respective priorities of commercial and public interests that must be brought about under international law. Therefore, the Tribunal strongly encourages authoritative bodies to address the legal and practical limitations that currently confine the scope, content and ultimately the effectiveness of international human rights law. As she wrapped up the April 18 press conference in The Hague, Tribunal Judge Françoise Tulkens said that while the judges’ work was done, the work of civil society has just begun. As we hope for international law to start holding corporations like Monsanto (or Bayer or Dow or Syngenta) accountable for the devastating consequences of their poisonous chemicals, we must also look for hopeful solutions for feeding the world’s growing population. Monsanto will have you believe that its failed GMO monoculture model provides those solutions—but increasingly, the world is wising up to that lie. I no longer see debates about the future of agriculture as simply conventional versus organic. In my view, we’ve oversimplified the complexity of the land and underutilized the ingenuity of farmers. I now see adopting farming practices that build soil health as the key to a stable and resilient agriculture. Do we have decades or centuries, as Tulkens suggests, for international law to crack down on Monsanto? Probably not, if climate scientists’ predictions are correct. But as humans with rights, and consumers with responsibility for our purchasing decisions, we can help fuel a Regeneration Revolution that can both cool the planet and feed the world — without poison.